How Id threw out its old identity, years of work and the game design rule-book to reinvent a classic. Doom. Marty Stratton had thought he’d known the meaning of the word. But only now, looking back at three years of hard development work and realising it would all have to be thrown out, did he truly understand. Binning dozens of your designers’ levels and concepts, telling the publisher you were abandoning a project and would need the money to start from scratch – this was doom. Stratton and Id had made Hell for themselves. It just wasn’t the kind they’d intended. Production on what was originally called Doom 4 had started back in 2008. Stratton had overseen creative direction; John Carmack, the last of Id’s four original founders to remain at the studio, had designed and iterated Id Tech, the game’s engine. Doom was not only Id’s flagship series but one of the most famous names in all of video games, so Stratton and his team had wanted to make the new iteration the best it could be. Which was why, come the beginning of 2012, all of their work had to be scrapped. Stratton knew the game had to go, but after three years in development – and with many more now needed – he was doubtful about Doom ’s future. ZeniMax Media had acquired Id in 2009; its subsidiary, Bethesda, was now the studio’s financier. If the publisher wasn’t sold on Doom ’s total change of direction, it would likely pull the plug. But Bethesda signed off on production of a new, reimagined Doom. With years of abandoned concepts behind them, Stratton and team had a good idea of what the game was not . It wasn’t set in the real world. It wasn’t linear or scripted, and it wasn’t filled with different characters. The accepted model for contemporary shooters didn’t apply to Doom – it wasn’t Call of Duty or Battlefield . So what was it? When modern video game players thought the word ‘Doom’, what was in their minds? Hugo Martin had the answer. A freelance character artist who’d previously worked at Naughty Dog and on the movie Pacific Rim, he arrived at Id in 2013 and quickly gave Doom its unique identity. “I spent a lot of time in intellectual property development in LA,” Martin tells us. “Everyone there has something they’re trying to develop. They want it to be a brand that has legs, so they can have an animated series and a comic book and so on. Working there, I’d picked up a lot. So the first night I arrived at Id, Marty and I started talking about the Doom brand. We wanted Doom to be a significant moment in pop culture, for people to look back at 2016 and think about Doom . We had hours of conversations trying to figure out what made Doom cool. We did lots of little exercises. For example, we’d go to Google, type in ‘Doom’ and see what came up. That was a great litmus test to see what consumers thought of the brand. By now, it wasn’t just the new Doom that was changing; Id Software itself was, too. In April 2013, 22 years after co-founding it, John Carmack left the studio to join Oculus VR. Martin was elevated from concept artist to art director and finally creative director of what was now simply called Doom , while Stratton was hiring in dozens of new designers and programmers to help the game take shape. What was once a top-down production – fronted by Carmack, the last remaining, original face of Id – became flatter and more collaborative. The initial panic following Doom 4 ’s cancellation was turning to cooperation and productivity. “Taken on the surface, John’s departure felt like it was going to be a challenge,” Stratton says. “You can’t work with someone like John for as long as most of us had by that point and not have a tinge of worry. But soon after he left, I said to myself, ‘There are a lot of games out there made without John Carmack’. John, like anyone of his ilk, wanted to do things his way. His leaving let us try other ideas. People who had worked under John were able to come forward and suggest different things. One thing, however, remained a constant. Like its 1993 namesake, when Doom launched, it had to stand at the cutting edge of graphics performance. Consequently, Id Tech 6, the latest version of John Carmack’s benchmark-setting game engine, was constantly being iterated upon and improved. Over the course of Doom ’s development, Id’s technology team created dozens of new tools for the level and gameplay designers. Textures became more detailed, animations faster and smoother. Where typically a game developer builds or licenses an engine, then sticks to it throughout production, Id was unlocking the power of its tech as it went. But even with the technology humming and the team working in unison, there was something about Doom that still wasn’t coming together. Looking at the original game, Martin and Stratton knew the reboot needed colour, momentum and brio. Analysing the current shooter scene, it was clear that scale, customisation options and at least a modicum of story were also important. Tying it all together, however, was far from simple. 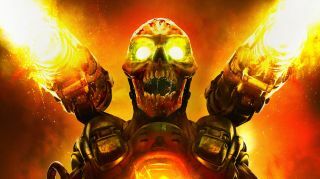 Described by Martin as “like spending three years giving birth”, perfecting the pacing and combat in Doom – essentially the game’s heart and brain –required a long time, exhaustive amounts of iteration, and several unconventional solutions. “We got to a point, about a year and a half into development, where none of the combat was feeling right,” Stratton recalls. “We were constructing levels that were very open, very flat, and you’d just have enemies who were charging at you – the maps didn’t open up lots of strategy. However, early in development, one of our designers created a prototype, just a grey box level, which we’d called the ‘movement map’. “There was a lot of attack and evade,” Martin tells us. “You could use the geography to get into space for a brief moment, or move around to flank enemies. The movement map captured that sense of an arena. You felt like a skater in a skate park, except you had a shotgun.” The movement map was a revelation. Now, the ideas, the designs and the levels for Doom were coming thick and fast. By the time it launched, Doom was bloody, action-packed and on the bleeding edge of game-making technology – everything for which Id had hoped. Thanks to the streaming service Twitch, Martin and Stratton were able to watch, live, as players around the world tried Doom for the first time. All of them were smiling. This article originally appeared in Edge magazine. For more great coverage, you can subscribe here.